Heroes! In celebration of the holidays, we're offering you the chance to win a rare and unique prizes! 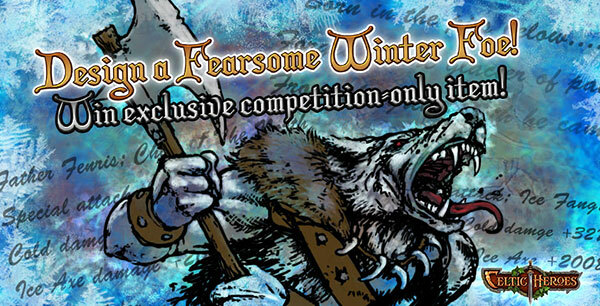 As a Celtic Hero, you’re always fighting against evil, but it is now your time to design a foe of your own! What evil creature do you dream of slaying? What ferocious being keeps you awake at night? Take inspirations from our Celtic world and design your worst enemy this holiday season! Capture the essence of a Celtic Heroes foe by drawing and/or writing up your design for a worthy enemy. Does he/she have ferocious claws? Do they wield a poisoned spear? Are they gigantic in size? Do they sit upon a throne with 3 minions to aid their dirty work? Delve into your imagination and create a foe to rival others! You can include skill names, foe name, foe specials etc, it’s up to you how much detail you want to give – the more the merrier! If drawing is not your thing, feel free to send us images that you feel best represent your design along with your foe’s detailed information (Please include the source of the images if they are not your own). - Details about the foe - information about skills, name, armour, special moves and anything else you'd like to include to give us better understanding of your creature! Deadline for entries is Thursday 8th January 2015 MIDDAY GMT. Winners will be announced on within two weeks of the end of the competition. NOTE: Offtopic posts will be removed so that this thread can hold entries properly. Well I can't give you a drawing because i'm not a great drawer, but here's my idea. Thanks for Cross Platform OTM! A new evil has entered Lirs reach. Giant death cap mushrooms. These aren't your normal mushrooms... this is the Mushroom king... as tall as the temple, wielding a death cap blade (200 poison damage and death cap 10% proc chance of 2000 damage). Before you even think of attacking the mushroom king you will have to kill the death cap minions. Half the size of the king these minions use a cloak of poison dealing up to 250 poison damage plus the damage from there fist( kill these to get death cap cure making you resist the death cap blade's proc chance). Also watch out for the healer mushroom who will make sure he keeps his king alive(kill the healer to get a normal death cap mushroom, but don't eat it yet or you might lose the fight). When you actually attack the king watch out for his death cap stomp (splash skill 500 damage), death cap punch(skill 500 damage to person punched), proc chance from his blade, and his poison spit (splash skill dealing up to 750 damage for 15 seconds), and his shroom sheild (blocks all hits for 30 seconds). Beware the king and his followers, but if you are able to kill the king, you will be rewarded with weapons of poison and a chance to get the death cap blade. All skills used by the king are evadable, but the proc chance from blade... unless u have a death cap cure. This creature uses magic damage, it draws power from the earth around it. It has a 10% chance of releasing its deadly gas, poison damage. EARTH RUMBLE- It pulls its roots from underground, causing the earth to shake, this can deal up to 2000 damage to anyone within an 8 meter range. SUFFOCATE- It wraps its vines around you, strangling you to death. This skill is like the Druids skill, strangling vines. This boss is 50% immune to magic damage. However it takes the most damage from cold, as this freezes its vines and heart the most. The symbol in the middle represents a celtic symbol and its heart. After 15 minutes the heart heats up, this causes the creature to become enraged. The heart glows with a bright Red. This creature summons its minions from underground, these look like little seeds that grow overtime and become stronger if not killed quickly. It summons 3 minions at a time. This occurs every 7 minutes. This creature can drop 3 tiers of Braces and rings. Braces druids and mages braces will have FOCUS, 100 for royal, 200 for imperial, and 250 for godly. Also a special proc chance to unleash vines dealing dot damage. Rogues and Rangers have STR and dex, 75/75 for royal, 100/100 for imperial, and 150/150 for godly. Also a special proc that deals up to 1000 poison damage. Warriors have Vit, 120 for royal, 200 for imperial, and 350 for godly. Also a special proc that adds 1000 damage to your attacks for 12 seconds. the rings will be the same stats but halfed. This boss will have a 1-2 day respawn time. The drops are NOT BOE. Last edited by druid2001 on Mon Dec 22, 2014 3:17 pm, edited 4 times in total. The Shadow Knight first was a soldier in a distant kingdom where dragons ruled. There he served in the royal army and was very famous and succesful. The dragons and humans had peace, and lived alongside eachother, humans in cities and towns, dragons in nests in the mountains. Grest, as the Knight was called back then served strict but fair, the royal army took down any criminal that tried to do something in the kingdom, and they were loved by the people. However, Grest became jealous of the dragons at some point, with all their treasure and jewellry. "Why would we let them have it, when the only thing they do with it is stare at it?" His king, however was a wise man who had succeeded in keeping peace for many years. "We lived alongside the dragons for many years, peacefully, our army is strong but we can't afford a battle against the dragons." However, Grest was stubborn and planned to fight the dragons with his 2 best friends, a skilled mage and druid, both serving in the royal army. Once they arrived at the dragons' territory they sneaked into one of the nests, yes there was a ton jewellry and gold, but also magic items. The 3 went and grabbed as much stuff as they could but suddenly, a loud sound was heard. The dragon woke up! Grest decided to fight instead of run and convinced his friends to do the same. It was a long fight and Grest took a lot of hits, but his druid friend kept him alive, while his mage friend kept burning and freezing the dragon. After some time it was done, the dragon was dead. Grest suddenly realised what he had done and slowly began to feel paranoid, he trusted nobody except his 2 friends. "Why does the king say we shouldn't fight the dragons, why wouldn't we fight the dragons?" His friends began to feel the same, and the 3 killed more dragons and stole their treasure. They became more paranoid and corrupted with each dragon they killed, at the end, almost all dragons were dead, few managed to escape. They made use of the killed dragons by forging their scales and into powerful gear which was hen enchanted by the combined powers of the druid and mage, they became stronger and stronger and eventually unbeatable by soldier in the kingdom. They went mad and killed every mortal in the kingdom. They now wander the lands of Dal Riata known as the corrupted three, nobody has been able to beat them, the Dark mage, Corrupted druid and the Shadow Knight. Dragon blast, deals cold and chaos damage to everyone. Flaming bolt, deals a high amount of fire damage to one person. Runic shield, he summons an energy shield as tough as dragon scales. Dragon regeneration, heals the shadow Knight for 1000 per tick. Dark lightning, she fires a lightning bolt at one enemy. Corrupted breath, heals the dark mage, shadow Knight and Corrupted Druid. She auto attacks slow but hits hard, and she will stop fighting if the Shadow Knight gets hurt. Dragon endurance, his resists are doubled but his damage is lowered by 25%. Dragon fury, his attack speed, attack, and damage are doubled but it halves armour, also can't be cast when dragon endurance is active. Shadow sweap, he teleports to a target and deals damage to everyone around that target. Shield smash, he smashes the target with his spikes shield causing the target to get stunned, deals high crushing and piercing damage. Once he is at 15% health he activates chaos frenzy, and he, the Dark Mage and Corrupted druid enter a battle frenzy casting their skill power to go up drastically for 30 seconds. He also has a strong runic protection on his armour causing him to have a high magic resist but he is vulnerable to pierce. This is my current foe. Last edited by DontHate on Wed Dec 24, 2014 10:33 am, edited 5 times in total. Should i draw druid n mage as well? 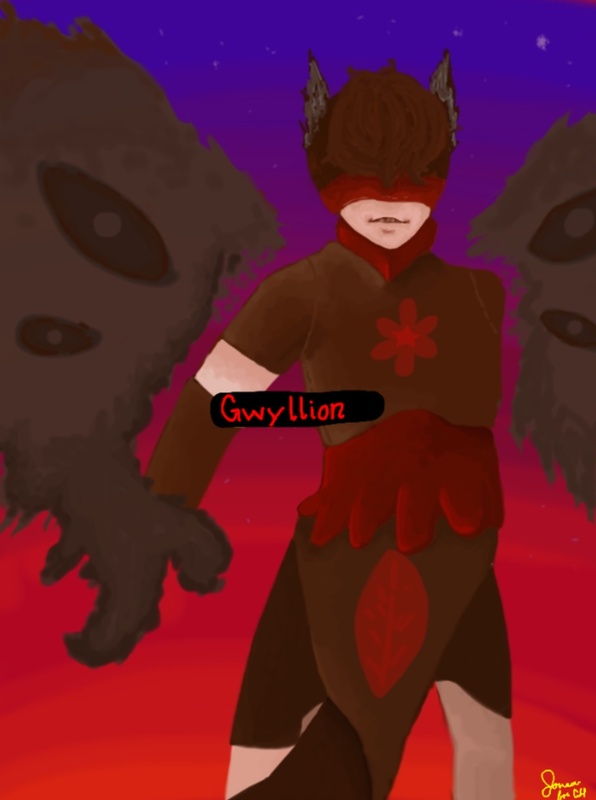 This is a Gwyllion, Ide the Unholy, or Ide the Gwyllion Queen. What's a Gwyllion? Sometimes taking the form of goats, these female faeries are hideous in appearance. They hide at roadsides, often making travelers become lost. They should be welcomed into a house or they can become offended and will cause mischief. Four Turtles wander to the Highlands, something that has never been seen before... They Carry axes which have blades that look like some sort of... Pizza?! Some clans attempt to take them down but fail... The Four laugh furiously while taking massive bites of their Pizza slices...It's too dangerous for one clan to take, the once foe clans join together to bring more power than ever... They come back for their 2nd attempt with the turtle(lvl 200)... Cheers!! Theyve Taken the Beast/s down!! They Celebrate by taking their Possessions... Another Victory for the Highladers!! my First competition feel free to make your own version... I did it pizza related because of the picture was gnna take too much time to add the lux drops but if you want me to let me know lol i'd be glad to ... Gl to my fellow Competitors... Hope i Win!! WHY DONT WE ADD A HYRDRA BOSS TO CELTIC HEROES, I mean we already have snakes in fingels cave (near loch Dorcha) so it will be nice if u make a cave that leads to the hydra with snakes surrounding it and the more deeper you go into the cave the more stronger the snakes are for example: LVL 70-90-120-150-180-200 and at the end should be the hydra boss with 3 snakes guarding it the hydra should be around lvl 200-210 and it should have 3 heads that do different types of dmg 1st head should do Fire dmg 2nd should do ice and 3rd should do lightning strike.Now we need to decide how much dmg each head does, I am not so sure how much it should be able to do (im not even lvl 150 lol) but since it's lvl 200-210 it will be ok if he does 4500 dmg together ( each head will do 1500 dmg ) but his normal hit should be 800 also he should have alot of hp approximately 800k or is that too less? But anyways the hydra should have no legs sort of like a hydra snake and should be nearly the size of Modris and if you have no idea on what a hydra is here is a photo of him it's not a drawing because I'm the worst artist in the world so.... Hope u like it.